City of Austn’s Imagine Austin “Centers and Corridors” map shows “regional centers”, “town centers”, neighborhood centers” and “activity centers”. Center-city has three de facto villages, aka “town centers”, that align in almost a perfectly straight line down the city’s spine. Map excerpt: City of Austin. Mary Rudig is a Gracy Woods Neighborhood Association coach and editor of the North Austin Community Newsletter. The following commentary has been adapted and slightly edited from her comments recently posted to selected recipients. 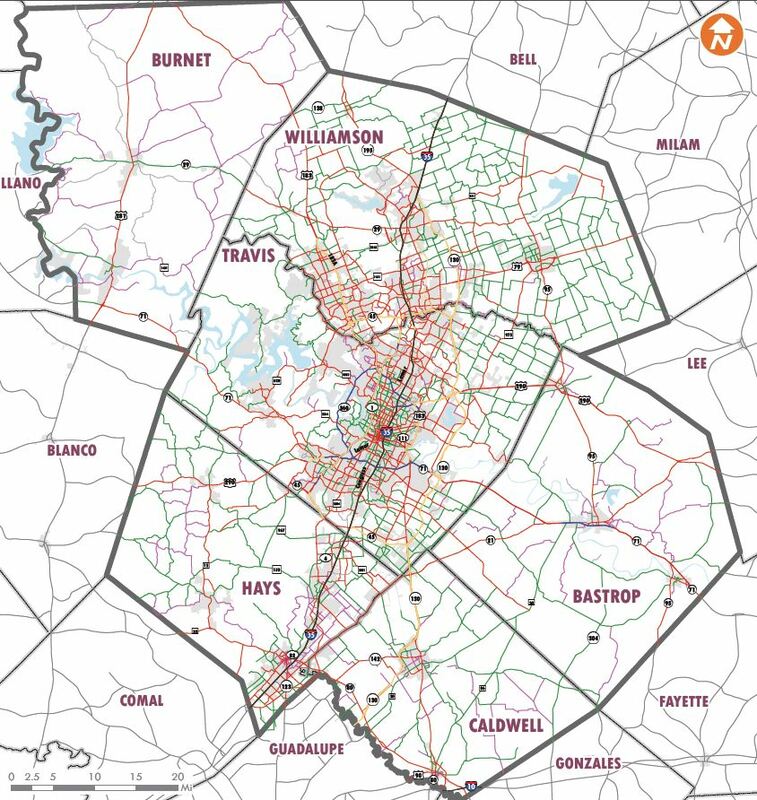 Right now, there is a very logical and straightforward way to create a solid transportation system in Austin — but it starts with all of us in this community having to realize that Austin, like most cities in the Southwest, is a village of villages. Most people don’t want to go downtown, they want to go to the next village. We need to go back to the Imagine Austin plan and start by truly connecting the major activity centers through rail, going down the spine of the city. Rundberg/Lamar down to the North Lamar Transit Center down to the Triangle, then into campus, then through downtown to Seaholm. Add rapid bus systems to connect the Parmer/Mopac tech employment hub, drop more rapid buses along Parmer so you can add density in the Techridge area to the Northeast, add another rapid bus system into Highland Mall/ACC, and another rapid bus into Riverside and down into Slaughter. Eventually those rapid systems will build enough ridership to justify more legs and spurs to the main rail line. Light rail transit starter line in Guadalupe-Lamar corridor could serve as basic spine for eventual urban rail system together with other transit modes connecting metro area “villages”. Second, we need to tear apart the PUD (Planned Unit Development) ordinance and basically make PUDs temporary TIFs (Tax increment Financing districts) — I would suggest twenty years. So to pay for the infrastructure, sidewalks, and other things to create this massive transportation plan, we could encourage neighborhoods to allow PUDs to be built, but the revenue and some of the property tax from each PUD would then go back into an account that can only be used for transportation and park/greenbelt/trails in the immediate area. Third, we would need to force developers to stop building massive parking garages every time they put in another apartment complex and insist, instead, that they have to come up with some matching funds to put in sidewalks and hike & bike trails that connect their development into the surrounding neighborhoods. Sure, the developers will howl, but we just need to tell them sweetly, but firmly, that sidewalks and hike & bike trails are actually far cheaper than parking garages, and we are no longer buying the idea that an apartment complex is truly “compact AND connected”, unless it has very few parking spots and a whole ton of, you know, actual connectivity into surrounding neighborhoods. If we can get enough PUDs generating some funds, then there will be plenty of cash on hand to match the developers’ funds. As for the idea (being promulgated by some community activists) that all of us in the outer ring of neighborhoods are living in “suburbs” where everybody is wealthy and low-density, that’s an interesting theory — let’s test it. 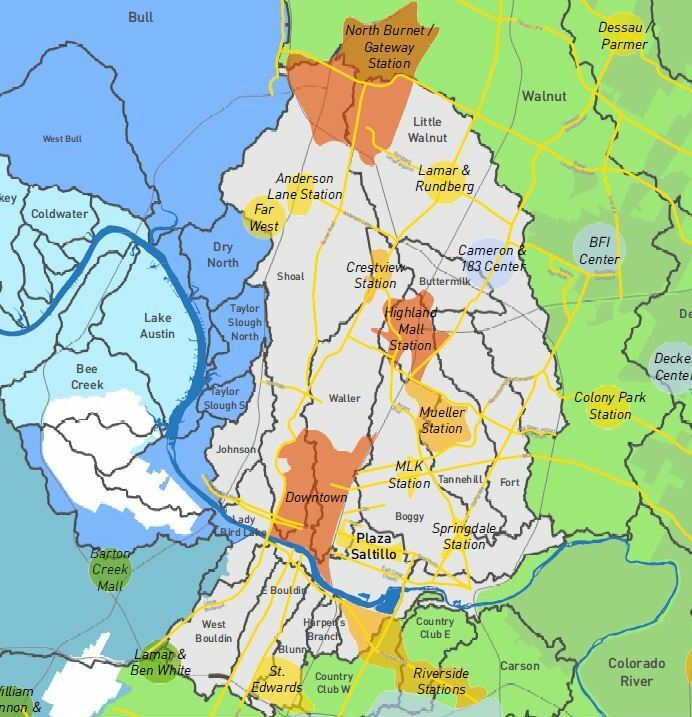 Let’s see, even though the City includes the Walnut Creek Metro Park into their density calculations, my neighborhood is still over 1200 people per square mile denser than the average density in Austin (4700 versus the typical 3500), and we have a ton of fairly affordable duplexes and older apartments. Oh, and I live in a 960-square-foot bungalow, on a street that is surrounded by duplexes, and we have the Domain two blocks away. Did I mention that I walk to work, my husband walks to work, my nextdoor neighbor bikes to work, and the neighbor next to him also walks to work? The truth is, the development crowd in this town keeps the myth of low-density outer suburbs going because they don’t want anybody to clue into the fact that the developers are — yup, actually building sprawl. A super-dense development carefully built to hide a massive parking garage, with a sidewalk that goes nowhere tacked on as a nod to “connectivity”? That’s a vertical gated suburban community that caters to the car culture, folks — and each one of these that gets built is pushing us a little further away from the goal of Austin having good mass transit and walkable, bikable connectivity. What’s with Project Connect’s “2.9 million daily ridership” projection? By far, perhaps the most controversial and eyebrow-raising element of Project Connect’s self-styled “study” to select a route for “high-capacity transit” has been the heavy use of projections. Crucial data inputs involved projections of population, employment, economic activity, travel, and congestion, mostly for the year 2030, 17 years into the future. On the basis of his quite comprehensive analysis, Julio concludes that “it is clear that Highland’s score is the result of speculative assumptions about the nature of development in the sub-corridor.” His explanation seems to imply that, because planners would like to see certain types of development in certain areas, they just go ahead, assume it will happen, and voila! these become the projected inputs in the “evaluation” matrix. The bottom-line is that the methodology awards points to larger parcels that are relatively undeveloped and (seemingly?) car-dependent based on an optimistic outlook on future land-use variances being granted. It is not a prediction of how parcels will behave in the future given what similarly-zoned parcels have done in the past. It is not a sophisticated statistical model of what is likely to be that uses historical data to forecast. Instead, it is scoring based on where the methodology-designers would like development to go that uses a proven statistical technique to classify the parcels into different bins based on parcel attributes. The methodology has not been validated, so we don’t know if it actually predicts anything. The public reasoning presented to CCAG by the PC team for Highland’s score is ‘significant future development’. Obviously, projects such as the ACC Highland Mall redevelopment and Austin’s evolving medical scene will have an impact on employment and residential density in the sub-corridor. But it also appears that the methodology selected assigns significant points to the type of parcels available in the sub-corridor. Needless, to say, the presence of certain types of parcels we’d like to see developed in a sub-corridor does not mean development will happen. Worse, it doesn’t mean they exist in a contiguous stretch that make sense for a transit route. Another way of saying this is that Project Connect’s planners have converted their own wishful thinking into actual data inputs, that are then deployed to make their evaluation. 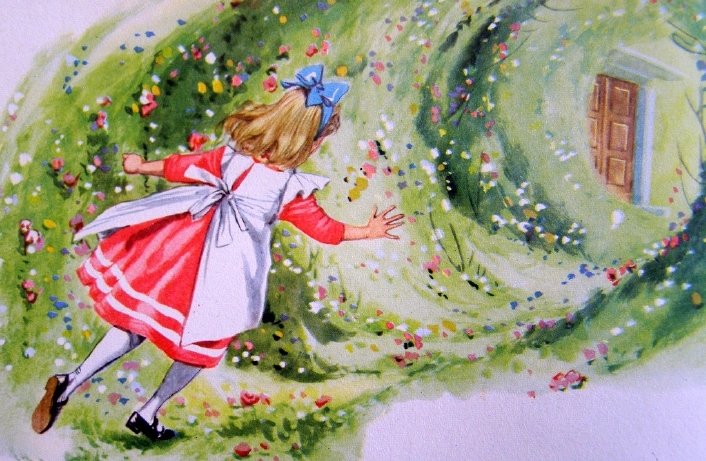 Wishes are used to try to make the wishes come true. In an effort to deflect criticism, Project Connect and some of its backers have mounted a “straw man” defense, trying to portray critics as absurdly renouncing the role of projections in planning major projects. But there’s a vast distinction between developing conservative, reliable, and plausible forecasts, and producing exaggerated, fantasy-like projections, as Project Connect has done, heavily skewed toward certain geographical areas. The question of projections has been an extremely contentious issue in Project Connect’s urban rail “study”. For many critics, the agency’s “projections” have represented de facto fantasies about what they would like to see, rather than the solidly reliable output of competent predictive analytics. So, where do the “2.9 million daily trips in East Riverside” come in? This is the result of plugging Project Connect’s demographic and economic projections for 2030 into their own transit ridership prediction model. According to the documentation, the TOI metric is envisioned to assess transit ridership demand at the level of a small analysis zone (Regional Transportation Zone), apparently a travel analysis zone (TAZ, described in the ARN posting Project Connect’s “corridor” study — without corridors!) Project Connect planners, however, have applied the model to considerably larger sectors covering several square miles with hundreds and even thousands of acres. These are related in a formula, with various coefficients, analytical relationships, etc., developed by the Portland researchers, to calculate the TOI, which is then intended to predict daily transit trips for zones or sectors (based on trips per acre). Incidentally, it’s worth noting that the TOI was designed to predict ridership potential for an entire urban network, not to evaluate discrete corridors or disparate areas of a city in a competition for a major transit investment. For Austin’s near-current (2010) data, the TOI model yields ridership levels that seem fairly plausible and reasonably close to actual experience. But when Project Connect’s own long-term future projections (i.e., fantasies) are plugged in — into its own model — the resulting daily transit ridership predictions (for both the “low” and “high” ends of the prediction range) are nothing short of jaw-dropping. 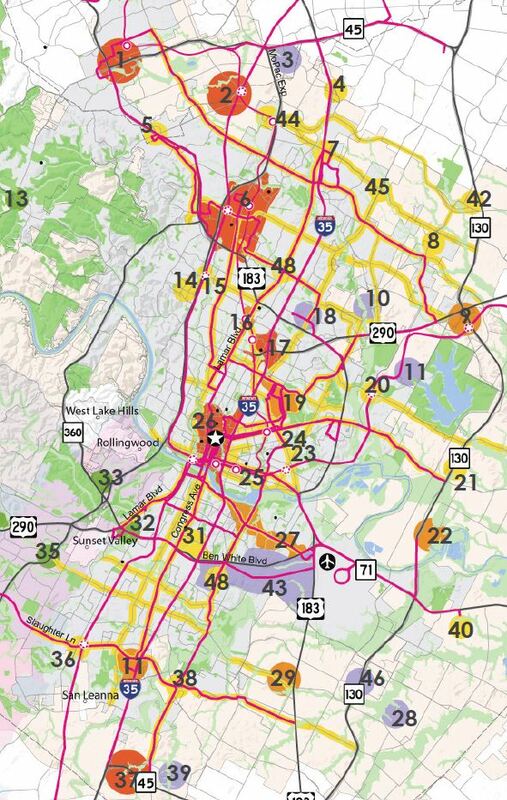 Much of the controversy has focused on the ridership predictions for the two sectors chosen by Project Connect (and embraced by both its “Central Corridor Advisory Group”, CCAG, and, most recently, the Austin City Council) — “ERC” (associated loosely with the East Riverside Drive travel corridor) and “Highland” (a heavily gerrymandered sector nestled next to I-35 north of the UT campus, then ballooning at its north end to encompass the Highland ACC site). The “ERC” ridership predictions for 2030 have been targets of especial ridicule. These are shown in the snippet below from the Project Connect “evaluation” matrix. Snippet from Project Connect’s “evaluation” matrix shows implausibly high year-2030 daily ridership projections, both low and high, for the “ERC” sector. The high-end daily ridership prediction of 2.9 million, it’s been pointed out, roughly equals the combined daily transit system ridership of the cities of Chicago and Philadelphia. However, Project Connect’s planners called Foul on this figure. For the top TOI index achieved by this sector, they point out that the TOI model yields an “infinite” multiplier to calculate the high-end ridership prediction. So Project Connect, with an index result predicting “infinitely” high ridership, decided to bring it down somewhat closer to Planet Earth’s reality by substituting an upper-bound value of 999 as the acreage multiplier to calculate ridership … and produced the “2.9 million” figure. Remember — 493K is the low-end predicted ridership for one single small segment of the Austin area. Currently, Capital Metro’s daily ridership for the entire service area is about 120K. For the “Highland” sector, the TOI model results for 2030 are similarly off the scale. Whereas current 2013 ridership is about 5K (5100/day), the “low” TOI prediction for 2030 is about 127K — an increase of 2,440%. The “high” prediction (no need for upper-bound substitution in this case) is 279K — a predicted increase of 5,480%. Put another way, to meet the lower-end ridership suggested by the demographic and economic projections, average daily ridership in the “Highland” sector would have to exhibit sustained average daily ridership growth of about 7,200 each year for 17 years. To most reasonable analysts concerned with the accuracy of their forecasts, such wildly implausible predictions would surely prompt a re-evaluation of the basic data inputs — i.e., the projections. But not Project Connect’s planners, who have simply hunkered down and circled the wagons around the inviolability of their projection methodology. 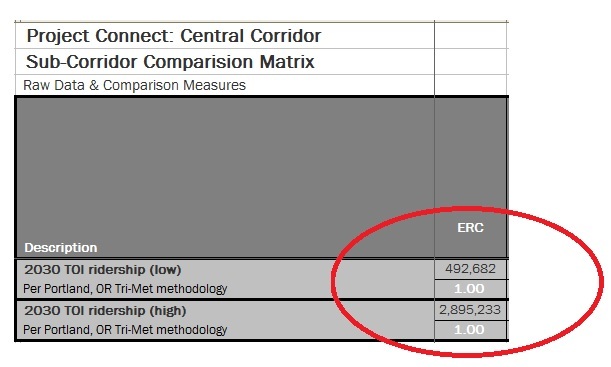 Project Connect personnel, and at least one City Councilman, have attempted to disparage this criticism by noting that the actual ridership predictions have not been used as a metric in Project Connect’s “evaluation” matrix. But that sidesteps the main issue! First, Project Connect’s matrix does use the TOI, itself based on the same dubious projection inputs, to render a metric score to bolster their preferred sectors (“sub-corridors”) in the competition they’ve set up. For the 2030 metric it gives a score of 1.00 to the “ERC” sector, and 0.65 to “Lamar”, in a points system where every hundredth of a point does count. But, even more importantly, the TOI for 2030, dependent as it is upon Project Connect’s “projections” (de facto fantasies), exposes their absurdity. No wonder Project Connect and its entourage don’t want these used … no wonder they attempt to distance themselves from them! It’s very simple — plug Project Connect’s own projections into this otherwise fairly realistic model, and you get bizarrely, unbelievably exaggerated results. Maybe a hint that the original projections are bizarrely unbelievable? In effect, the TOI is performing here somewhat like a “canary in the coalmine” — telling Project Connect, and all of us, that something is terribly wrong with their demographic and economic projections for 2030. Obviously, it’s a message that Project Connect, and a certain segment of Austin’s civic leadership, don’t want to hear. With its 7-0 unanimous vote on December 12th, endorsing Project Connect’s deeply flawed plan for an initial urban rail line, the Austin City Council made it clear it wasn’t just abandoning good sense and a reliance on sound, fact-based planning — unfortunately, the Council vote continued a pattern of recent policies by the City of Austin (COA) aimed at abandoning Central Austin itself and the core neighborhoods in the heart of the city, concentrating instead on predominantly promoting peripheral areas mostly to the east. In effect, the Council’s action was a vote that said to Central Austin: Drop Dead. This pattern appears to reveal a major switch from past policies, which have aimed at strengthening the central core city and addressing mobility problems in the city’s major local traffic arteries, Guadalupe St. and Lamar Blvd. For example, urban rail plans in both 1993 and 2000 focused on this corridor, and Guadalupe-Lamar-South Congress was a major focus of the “rapid bus” plan (now MetroRapid). Project Connect’s proposed urban rail route profile forms a crescent emphasizing more eastern sectors of city and avoiding heart of central city along West Campus-Guadalupe-Lamar corridor. Note how “Central Corridor” study area is skewed well to east of core area, encompassing large tracts of developable real estate. 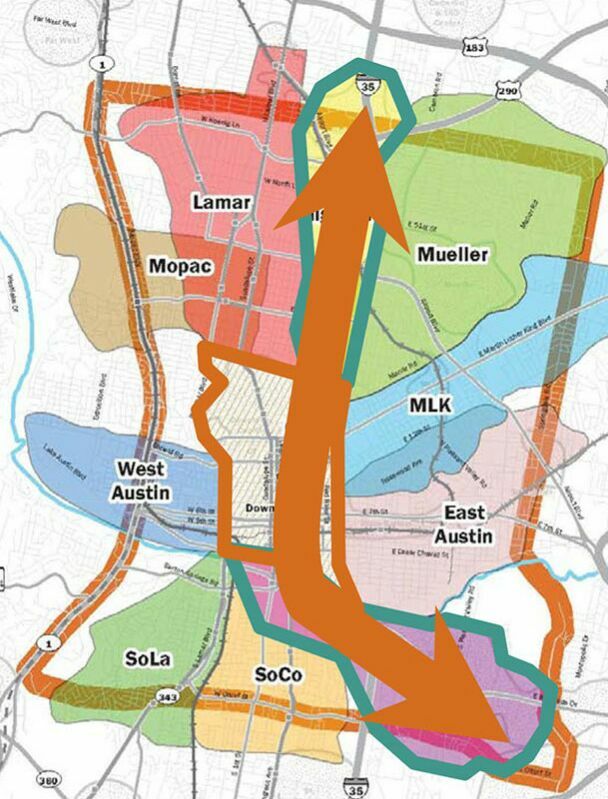 This switch in policy is borne out not just by the Council’s Dec. 12th vote, and not just by the efforts of Project Connect and its supporters to depict Central Austin and its “backbone” travel corridor (West Campus-Guadalupe-Lamar) as more or less “withering away” demographically and economically (in complete disregard for the factual evidence). The pattern of neglecting the central heart of the city has become increasingly clear from COA’s preferential policy emphasis — expressed through tax incentives, infrastructure investment, long-range planning, and special projects focused exclusively on encouraging development in peripheral areas such as Mueller and East Riverside. While the core area itself (downtown, Capitol Complex, UT campus) has been the focus of densification and new public development initiatives (e.g., Seaholm, Waller Creek project, proposed UT medical teaching facility), most of the city’s established core neighborhoods, both north and south of the core area, have been virtually written off in recent years. Each proposed center is identified in the main document (linked above) by a number, with red indicating major “regional” centers, orange indicating “town” centers, and yellow demarcating “neighborhood” centers. 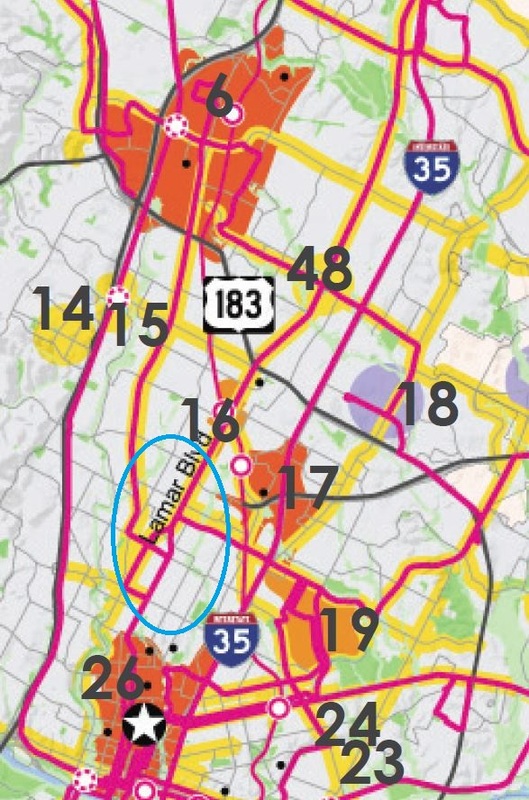 It can be seen that, outside the core area itself (a “regional” center), and the former Highland Mall area (now a major ACC site), most of the central inner city, following the traditional linear growth pattern along Guadalupe-Lamar and South Congress-Manchaca Rd., is comparatively very lightly targeted for “centers” development — there’s just one small “town” center at the Crestview MetroRail station, and a “neighborhood” center in the vicinity of St. Edward’s University (South Austin). Despite the lofty rhetoric by COA officials promising to “bolster the city’s core” and so on, the really large-scale, influential pattern revealed in this “wish list” map is to emphasize outlying development, mainly associated with major freeways or highways (e.g., U.S. 183, I-35, U.S. 290), and peripheral development areas such as East Riverside and the “close-in suburb” of Mueller. There’s also a decidedly eastward skew to this plan, with major “centers” planned as far as SH 130 and even east of it. The Austin region will continue to experience intense urban sprawl …. Although there is an enormous amount of residential development currently underway within the urban core and in downtown Austin, the thousands of new units being created there will be only a drop in the regional bucket of total residential units created. There simply are very few land availability constraints in the territory surrounding Austin. This abandonment of the central city and its core neighborhoods is evident in the map segment below, zoomed-in from the larger map. For these core neighborhoods and commercial areas north of the core area — particularly the area circled in blue — there are no “centers” in COA’s vision — despite major activities and opportunities in areas such as Guadalupe-38th St.-Lamar (Central Market, medical facilities), the Triangle (multi-use development), and Koenig at Lamar (major opportunity of for redevelopment as a major center). Similar sites further north (e.g., North Lamar Transit Center area) and south (SoCo area, Manchaca/Stassney, etc.) are also ignored. Central Austin’s core neighborhoods and commercial areas should take heed. 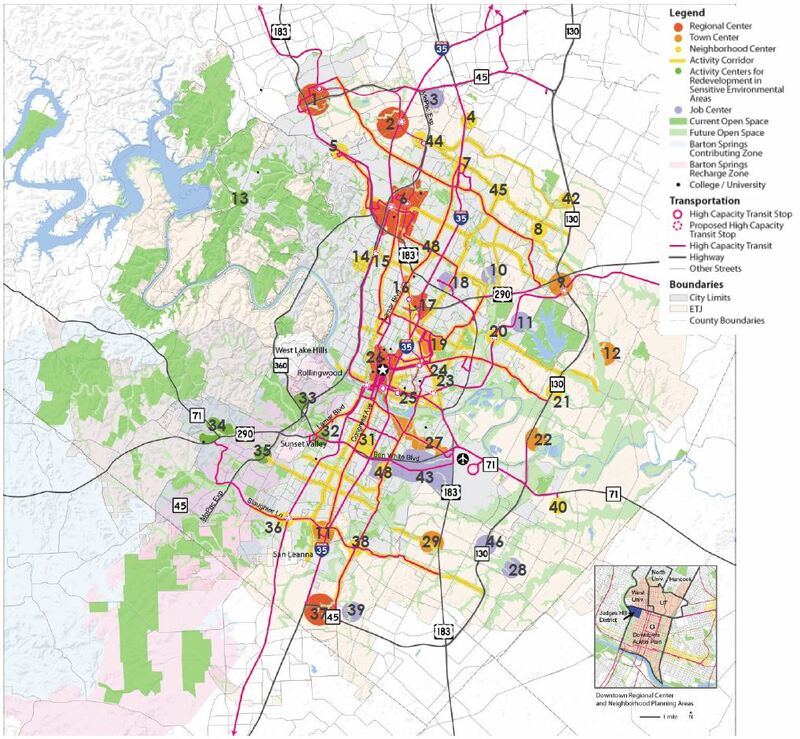 Project Connect’s willingness to scrap the future of these crucial areas, and its plan for urban rail to bypass the central city and its established neighborhoods in preference for stimulating outlying development, should cause major concern to Austinites as a whole. Far from confined to Project Connect, it’s apparently merely the latest move in an insidious emerging policy by the COA administration itself.